Happy grilling season! Can you smell the smoky BBQ wafting through the nighttime summer breeze? Or are you distracted by the light weight of your wallet? If you want to grill a flavorful steak on a tight budget, look no further than the chuck eye. C’mon, everyone knows the secret lies in the fifth rib. The chuck eye—indeed the fifth rib of the cow—lives on the butcher’s edge between the chuck and the more renowned rib eye. This cut has rich flavor and nice meat-to-fat balance similar to rib eye, but costs less. That doesn’t mean that you can treat it exactly the same; whatever you do, don’t cook the chuck eye well done. Actually, there are lots of people who will say just don’t cook beef well done, period. Perfect for grilling or pot roasts. Versatile and untraditional, the flat iron cut (also known as “top blade”) comes from the shoulder of the cow. A trendy cut popular among food chains and upscale restaurants alike, a flat iron steak can be grilled, braised, pan fried, marinated, and everything in between. The bonus? It’s affordable. This meat – although tougher than a sirloin or fillet – has delicious flavor and marbling beautiful enough for Lady Gaga’s wardrobe. Get creative: this cut can be cooked in many ways, just be sure to not overcook it. Skirt steak is a cut of meat from the plate – the long, flat, and flavorful bottom ribs of the cow. Flank steak is a similar cut. Both skirt and flank steak cuts can be used in a variety of dishes, most common in Colombian (think fajitas) and Asian (stir-fry, anyone?) cuisine. Flank steak is best when sliced across the grain before serving. Grill, pan-fry, broil or braise for increased tenderness. 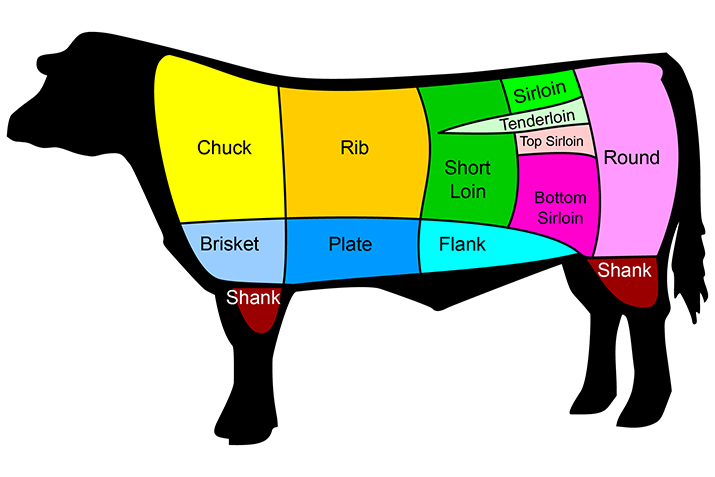 The sirloin is a large area cut from the rear back portion of the cow. The most prized and tender of this area is top sirloin. If you’re looking for something a little easier on the wallet, the tip sirloin is a leaner horseshoe-shaped cut ideal for cutlets, stir-fry, kebabs, and stew. Cooked right, the tip can be just as top as the top. Because it’s lean, tip sirloin can be dry and chewy, so it should be marinated for a few hours before grilling, broiling or pan-searing. The chuck arm comes from that larger chuck area surrounding ribs one through five. The muscles in this area get a lot of work, so the meat tends to be tough, but this makes it ideal for kebabs and stews. Also, the cuts from this area are plentiful, thus cheap! Pair with some grilled veggies for a saucy combo fit for late-night fiestas. Perfect for braising (grilling not recommended). Though no filet mignon, all these cuts add variety at the right price. Cook them with care, and you’ll enjoy great flavor all summer long. Note: Some of these cuts may not be displayed at the counter. So make a personal request; befriend those nice meat folks behind the counter (if you’ve read this far you’re bound for special treatment anyway).